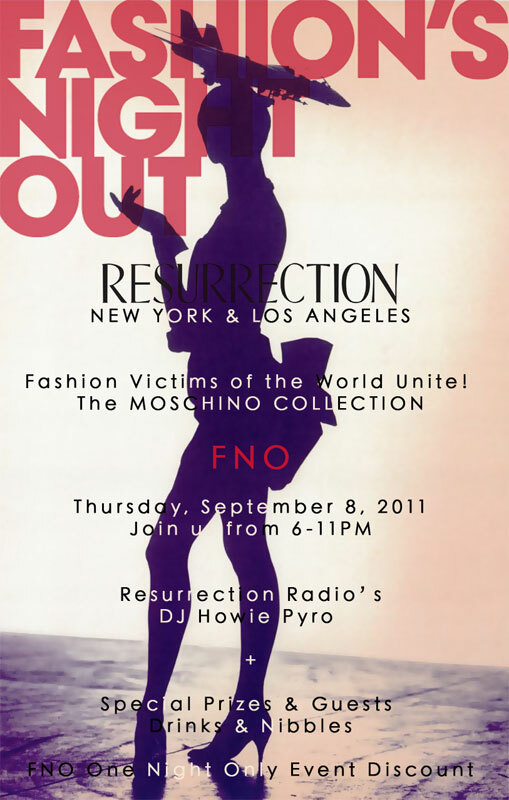 As predicted, there are more cool events popping up for Fashion’s Night Out. Santa Monica Place has a number of fun events and promotions planned for the big night. There will be two live fashion shows (6:30 p.m. and 8 p.m.) in the Plaza featuring the latest styles from Bloomingdale’s, Nordstrom, Michael Kors, Kenneth Cole, Betsey Johnson (to name a few) and a debut of Lisa and Brittny Gastineau’s jewelry line. Seating is limited so be sure get there early. In addition you can treat yourself to a beauty consultation and mini-makeover from Bloomingdale’s Laura Mercier. Benedetta and L’Occitane will be providing free hand massages and Carlton Hair will treat guests to complimentary bang trims and 10 minute hair styling. A number of retailers including Beachy Cream, Bloomingdale’s, Kenneth Cole, and La Sandia, are providing special offers with any clothing donation to OPCC. LL Cool J will be presiding over the events at WestfieldCentury City, which will include fashion shows, mini manis, blowouts, makeovers, and a FIDM dress design competition. Guests can also purchase custom T’s and totes and there will be a number of special pop-up shops to enhance the retail experience. Tori Spelling will be the honorary host at the WestfieldTopanga Canyon Location. Shoppers can expect a fashion show at Free People, a reception at Louis Vuitton, makeovers from Jennifer Gimenez and Greg Zarian, fashion tips from celebrity stylist George Blodwell, and giveaways. Carmen Steffens in the Westfield Fashion Square will celebrate the launch of their Fall/Winter Collection with wine and hors d’oeuvres. Carnival will be the theme at Alice + Olivia. Shoppers will have the opportunity to indulge on sno-cones and cotton candy while playing carnie inspired games. Discounts, chocolate, cheese, wine, and a DJ will be present at Arm Candy Handbag Boutique. Space 15 Twenty will be teaming up with Lomography GalleryStore LA, Foam Magazine, and KXLU DJs in order to bring you a massive FNO party that will feature drinks, discounts, tunes, and a free lomography workshop. Resurrection Vintage will be having a party at their NYC and Los Angeles locations complete with DJ’s, refreshments, surprise guests, and special prizes. The New York store will showcase a rare collection of vintage Moschino and the most lavish shopper will win a customized playlist by DJ Howie Pyro. The fashionable internet retailer ShopBop will go live for one night. If you’re in NYC be sure to stop by Louise Roe (9th Ave and 13th Street) and visit the ShopBop Lounge where you can enter for a chance to win a $5000 ShopBop gift certificate. If you can’t make it to NYC you can always purchase something from their site online. Andaz Hotel will host a Pop Up Shop/Red Carpet Fashion Exhibition hosted by celebrity stylist Brett Alan Nelson. Looks from Little Shilpa, Marco Marco, and The Blonds will rock the red carpet. Be sure to score some killer goods from Dopel Ganger, Gabby Applegate, good hYOUman, Isabel Garreton, Marco Marco, Nooka, Onch Movement, and Orthodox. Zimmermann will host their first ever Fashion's Night Out in their recently opened Los Angeles boutique with music by DJ Brandy Eve, Brancott Estate Wine and champagne. Guests who spend $200 or more will receive a beautiful printed Zimmermann beach towel. FNO officially kicks off at 6 p.m. on September 8th. Have fun and shop to your heart’s content. Be sure to come back and tell us what your favorite purchase or event was and visit the Fashion's Night Out website to pick up your official FNO gear.